When a power outage occurs, CWLP crews work to restore service as quickly and safely as possible. Year-round we dedicate resources to ensure the delivery of reliable and safe service to our customers. From continuously updating our infrastructure, to trimming trees and maintaining a rapid response from our crews, we work to minimize service interruptions. For the fastest response to an electric service outage or emergency, report to Electric Dispatch at 217.789.2121*. For the fastest response to a water service outage or emergency, report to Water Dispatch at 217.789.2323 ext 2. NEW Check your outage status and see where service is affected on our interactive Outage Map. *Attempting to use other means to report a power outage or other emergency (including by emailing or calling other department phone numbers or by posting to CWLP's social media pages) is NOT the most efficient way to ensure your report gets through. In fact, using these other communications options might significantly delay your information from reaching the appropriate response personnel. Although our Electric Dispatch phone system has been designed to allow a large number of calls to be handled quickly and efficiently, it is possible that—during very widespread outages—you might have difficulty having your call quickly answered by either a live dispatcher or the automated system. If this should happen to you, please know we are doing our very best to respond to all calls and we need to hear from you. If Dispatch isn’t already aware of your power outage, please keep calling until you get through. If you haven't blown a fuse or tripped a breaker, check your outage status and see where service is affected on our interactive Outage Map. If your outage is not on our map, call 217.789.2121 to make a report to ensure Electric Dispatch is aware of your trouble. During widespread outages, there is a possibility that our phone lines could be overwhelmed, making it difficult for you to get through. If you should experience difficulty reaching us, please try again later and keep trying until you are successful. When in an outage, it is a good idea to turn off (unplug, if possible) lights, appliances and electronics. This will help protect them against a possible surge when power is restored. Try to limit opening your refrigerator or freezer to keep food cold. When a large number of outages occur, there are many logistical details that must be worked out both before power restoration can begin and while it is being carried out. CWLP has a detailed emergency response plan in place for dealing with these logistical concerns and prioritizing restoration work. After outage events, utility officials review and, if necessary, modify the plan based on lessons learned from each event. Power restoration logistical planning begins as soon as the utility becomes aware of impending extreme weather. Staffing at the utility's Electric Dispatch Center is increased to handle incoming phone calls and line crews are placed on alert. When an outage occurs, crews begin damage assessment as soon as it is safe to do so. Depending on the severity of the damage and how widespread it is, this process can take anywhere from several hours to several days, and often continues after power restoration work is well underway. Another early step in the logistical process for outages with widespread damage might involve issuing a request for assistance under a mutual aid agreement from another utility. During this same time, staff members are working with suppliers to obtain poles, wire and whatever other materials will be needed to repair or replace damaged equipment. As with the damage assessment, this process is typically ongoing throughout the restoration period. Often, during a widespread outage, loss of service is caused by damage to substations or major transmission lines or towers. Damage to these types of infrastructure components can affect thousands or even tens of thousands of customers at a time. However, hundreds or thousands of other storm-related outages may be more localized, occurring, for instance, when branches fall on distribution lines that might serve anywhere from one to a handful of customers each. During a large-scale power outage, customers can be affected by one problem (for instance, substation damage) or by a combination of problems (for instance, substation damage and a downed service line). All problems affecting a customer must be corrected before their electricity can be restored. CWLP uses a three-phase, prioritized service restoration plan that is designed to ensure power can be restored to the greatest number of customers with the greatest possible speed. 1. Even while damage assessment is still being done, our line crews get busy repairing downed or broken high-voltage transmission lines that provide power to our substations, as well as any damages that might have occurred to the substations themselves. Focusing on repairing these facilities allows us to restore power to the largest number of customers in the quickest possible time. Also as part of Priority 1, we concentrate on infrastructure repairs that will ensure the restoration of power as quickly as possible to frontline public health and safety providers, including hospitals and police and fire stations. 2. As soon as is feasible, we begin focusing our efforts on restoring power to facilities that provide needed public services. Such facilities include critical state and federal government agencies, sewage pumping stations, and schools or other buildings that can be used as shelters for customers who are still without power. 3. During priority phases 1 and 2, power will typically be restored to a large percentage of all customers affected by the initial outage. However, damage to transformers, poles, and distribution and tap lines that serve small areas can leave clusters of outages (of anywhere from one to a few dozen customers each) scattered throughout the city. In the Priority 3 phase, we concentrate on restoring power to these customers. These "localized" pockets of damage are usually the most difficult and time-consuming to deal with. All power restoration work addressed by Electric Dispatch and assigned to crews in the field is geared towards restoring power to the largest groups of customers as quickly and safely as possible. Unfortunately, during a major outage where multiple locations are affected, determining how long it will take to restore power to any given area of town or individual customer can be extremely difficult. This is especially true when significant, widespread infrastructure damage has occurred. Sometimes, the best answer we can give is that our crews are working around the clock and will continue to do so for as long as it takes to restore power to every customer. However, when the cause of an outage is identified, assessed, and resources are assigned to make repairs or restore power, estimated restoration times can be made available. Estimated restoration times are posted with each outage on our Outage Map. You can also use this page to confirm outage start times and see if crews are assigned. Note that data to the map may be delayed during widespread outages and may not appear in real time. Exact estimates are not possible due to the nature of most repairs and the electric system. Estimates may change, too, as new information from the crews is made available, such as related to weather, unforeseen conditions or unexpected damage. For most widespread power outages, updates are shared with local media and posted on CWLP's Facebook page and Twitter page, which can both be accessed via a smart phone or other electronic device. Because of the way the electric system is set up, it is entirely possible that nearby homes or businesses might have their power restored before yours is. However, if you notice that your neighbors have power but your service is still out, please check the Outage Map or call 217.789.2121. If your individual outage is the result of an isolated pocket of damage or a downed service wire about which we are unaware, your call will alert us to that. During storms there are times when your overhead electrical service line could be damaged and would be in need of repair in order for your power to be restored. 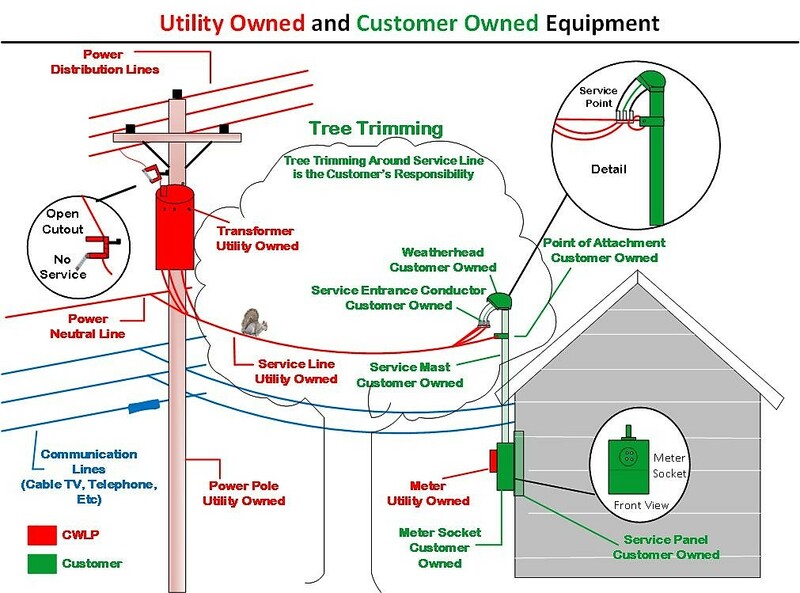 Since customers do not routinely have work done on their electrical service it is important to know what repairs are customer responsibility vs. those of the utility in order for power to be restored quickly and safely. In the image shown right, the green indicates equipment if damaged, which would be the customer’s responsibility to have repaired. After a storm, damage can occur and cause hazards with lines often coming down or drooping very low. Even when power is out, always assume all lines are live and keep a minimum of 10 feet away. The sooner electric trouble is reported, an inspection can be done to determine if you’ll need the services of a licensed electrical contractor. If you have any questions or need assistance in identifying equipment or have safety concerns before work is done, call our 24-hour Dispatch, 217.789.2121. In the event of an emergency or widespread power outages in the city, and you are not able to get in contact with Dispatch, a local licensed electrical contractor would be familiar with what equipment repairs will be necessary and what CWLP can do to facilitate the repairs. In the event of electrical fire or sparking wires and you can’t get through to our Dispatch, please call 911. For information about trees in conflict in lines and responsibilities for trimming, visit here. When you call our Electric Dispatch telephone number, 217.789.2121, to report an outage, our Outage Management System (OMS) works better when we have your correct phone numbers on file. Through our Integrated Voice Response (IVR) our phones at Dispatch are synced to automatically populate our outage map by identifying your location and when available, can provide you with a status report on whether you are in an area being affected by a known service problem. This can dramatically improve the speed with which we are able to respond to service problems and to provide you with information about them. However, optimum performance of this response system is possible only if we have accurate customer information. To ensure we have correct phone numbers on file for your account, please contact Customer Service at 217.789.2030, cwlp.customer@cwlp.com, or use one of our forms on the following page. To report a street light outage or other non-emergency utility issue, please use the report a problem page.